Arco-Íris (Leiria, Portugal) on 21 November 2013 in Landscape & Rural and Portfolio. How sweetly refreshing this feels - even if it is 5am here ! so so beautiful composition, colors & lights! Magical with the bright colours and misty water. Great result thanks to 3 seconds. Whaoooooa magnificent landscape, a beautiful composition and fantastic colors. Excellent control of the slow speed. A great shot, I love it. Lindas cores! Saturadas mas não exageradas. Ficou uma cena muito agradável. 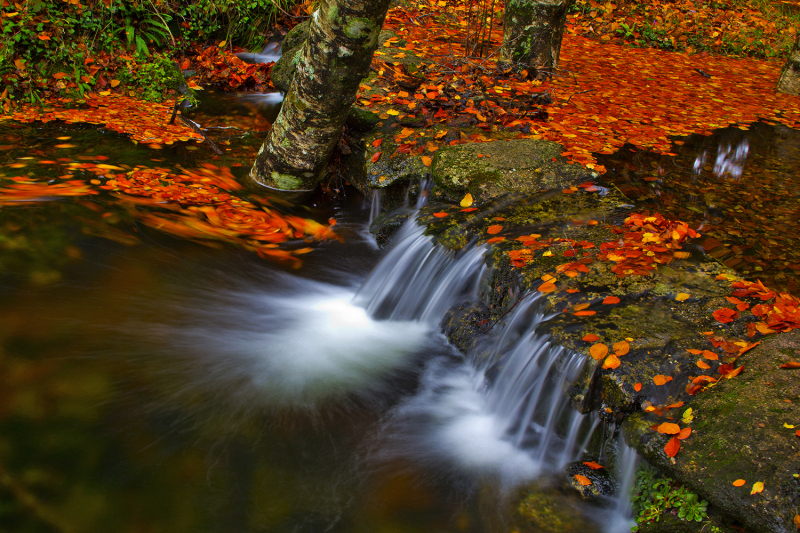 Gorgeous scene - love the motion of the water and those autumn leaves. I especially like those leaves that are spinning in a circle next to the tree. Nice shooting! Vou ficar caladinho e de olhos bem apertos, a contemplar esta bela fotografia. A superb scene and color. Very Beautiful indeed! This small ponds with the flowing water and all those colourful scattered leaves is a kaleidoscope of small marvels! I love the composition and the contrast between the smooth falling water and the other textures all around. It vibrates with light even in the shade. An outstanding capture. Superb !! Excellent image, with a great control of timing ! Lovely colors. Even that wanted offset is a great result. Great !! É tão feio ter INVEJA ! Nunca tive essas folhinhas vermelhas nesse sítio ! Um beijo e PARABÉNS ! A gorgeous image from this dreamy spot. Brilliant work, Ana! A gorgeous shot of these falls. The water treatment is superb. the colours are outstanding and the composition is superb! Very good color & light. Lovely, well done autumn detail. This image is very very beautiful. The color and whirlpools are superb! Super shot...Love the longer exposure of the water and the pop of the leaf color. Delighted to revisit this gorgeous image as part of the 2013 Faves theme. Happy New Year Arco-Iris! . . and a very strong choice for your 2013 Fave - love it still ! Nem sei porque vou participar !! !